The $250 million Georgetown Wet Weather Treatment Station (WWTS) in King County, Washington, has received the Envision® Platinum designation for sustainable infrastructure, awarded by the Institute for Sustainable Infrastructure (ISI). To reach Platinum status, a project must demonstrate that it delivers a range of environmental, social, and economic benefits to the host and affected communities. The Georgetown WWTS is the third Envision-recognized project in Washington State and the first to receive the Platinum award. 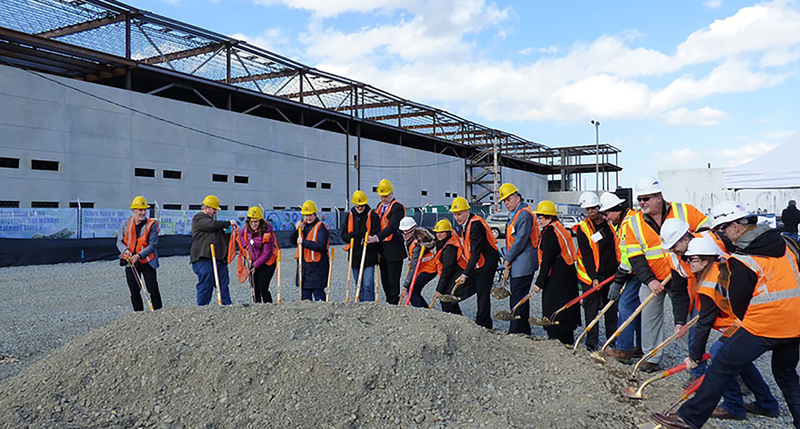 “The King County and Jacobs team planned and designed a sustainable project that meets the water quality requirements and emphasizes our commitment to diversity as it relates to our community, contractors, workforce, and vendors. We did this while maintaining a transparent and collaborative process,” shared Matoya Darby, King County Project Manager. Currently, heavy rains fill up the area’s sewer pipes, sending polluted runoff and raw sewage directly into the river. One of the central goals of this project is to help clean up the Duwamish River by treating stormwater runoff and sewage in times of significant rainfall. The Georgetown WWTS is part of a larger CSO Control Plan Amendment that will reduce CSO overflows into local water bodies and protect public health and the environment. In this Plan Amendment, there are 14 current or approved projects left to complete to reduce overflows that occur in the regional wastewater system, including the Georgetown WWTS. “Our Jacobs-led consultant team, working alongside King County, share in our commitment to a sustainable future, and are proud to have developed this innovative and resilient infrastructure to improve the quality of the Duwamish River and Puget Sound,” stated Tina Hastings, Jacobs Project Manager for the Georgetown WWTS. King County Wastewater Treatment Division worked in close collaboration with our Jacobs-led team including HDR, Environmental Science Associates and an additional 17 key sub-consultants to deliver this award-winning sustainable project. The Georgetown WWTS project will reduce contamination and improve aquatic habitat and overall water quality of the Duwamish River which is a traditional fishing ground for the Muckleshoot and Suquamish Indian Tribes. Additionally, the Station design includes many sustainable elements, based in part on input from the community, which will enrich overall community quality of life, including new trees which will further filter stormwater, improve the urban tree canopy, and lead to air quality improvements; a green roof which will also help to clean and filter stormwater, reduce heat island effects, and create educational opportunities for the community; a combination of cisterns and rain gardens which will collect stormwater for site irrigation while filtering runoff and reducing peak flow during rain events, improve the overall appearance of the Station, and provide additional educational opportunities for the community. The project team undertook studies to predict noise and vibration levels that would be present during the construction and operation of the WWTS and put solutions in place to reduce both noise and vibration compared to prior land use on the site. For example, the project will arrange construction trailers and treatment tanks to serve as a continuous noise attenuation wall during construction, and insulated enclosures and silencers will be installed on permanent equipment to reduce noise and vibration when the Station is operational. The project team sought to restore existing community infrastructure assets to achieve higher performance through community-wide infrastructure systems integration. For example, the project includes a new outfall structure and an improved water conveyance system, both of which play an integral role in the overall wastewater treatment system for the County. The project team also partnered with DIRT Corps and Stone Soup Gardens to build green stormwater infrastructure – a rain garden and two cisterns – at a local grocery store. Furthermore, the project team worked with the community to obtain grant funding to support the implementation of improved, safer pedestrian connections to the Duwamish River and funding to support the construction of a 135 foot-long and 12-foot high Green Wall on the block encompassing East Marginal Way and 8th Avenue in Georgetown which will help considerably with the dust and air quality issues in the area. These community projects and improvements are viewed as a critical part of the Georgetown WWTS project’s overall success. These creative initiatives enabled the project team to interact more closely with the community and enhance community and environmental infrastructure based on community-identified needs. The entire project site is located on previously developed lands used for residential purposes in the 1940s and then for commercial and industrial purposes since the 1960s. The project site has contamination documented by Phase I and Phase II Environmental Site Assessments and is listed as a “Leaking Underground Storage Tank” property by the Washington Department of Ecology. Sites with this type of contamination are considered brownfields and require remediation. The Georgetown WWTS project will remove the contamination caused by leaking storage tanks and remediate the area. The GWWTS stormwater design included flow control of all on-site stormwater. Projects typically accomplish this through the use of on-site below grade storage tanks that can be pumped back to the combined sewer system during non-peak times. The GWWTS project is approaching on-site stormwater management differently; the project will be utilizing several stormwater best management practices to provide an integrated stormwater strategy that includes peak flow attenuation and many landscaping features to meet code requirements. These features include stormwater reuse, bioretention, permeable surfaces, and a vegetated roof. The selection and layout of the stormwater system was intentionally designed to provide educational opportunities that are not available with other stormwater management approaches. The County will be offering educational tours and on-site interactive lessons for school groups and the general public.